Due to Castech/Sylatech continuous investment strategy, we are pleased to announce an increase in lost wax investment casting and CNC machining capacity. For more information on that then please do not hesitate to contact us today. At Castech (UK) Ltd we specialise in the manufacture and supply of precision cast & machined components supplied complete to drawing specifications. 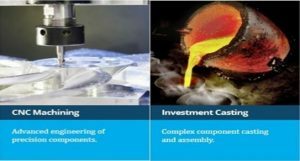 We continue to lead the field in the production of thin wall, complex, super-fine surface finish lost wax investment castings with a variety of UAV/drone applications within the aerospace & defence industries. We also manufacture components for ROV & AUVs including aluminium, brass and bronze propeller castings. With a continuous focus on quality all components are manufactured in accordance to AS9100/ISO9001 & Nadcap certification.